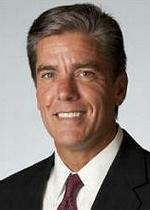 “We’ve made progress in Alaska, but this is a long-term program that we are pursuing in a safe and measured way,” said Marvin Odum, president of Shell Oil Company. Alaska remains an area with high potential for Shell over the long term, and the company is committed to drill there again in the future, he said. If exploration proves successful, resources there would take years to develop. “Shell remains committed to building an Arctic exploration program that provides confidence to stakeholders and regulators, and meets the high standards the company applies to its operations around the world,” said Odum. “We continue to believe that a measured and responsible pace, especially in the exploration phase, fits best in this remote area. “Our decision to pause in 2013 will give us time to ensure the readiness of all our equipment and people following the drilling season in 2012,” he said. After problems with both of its drilling vessels, the Noble Discoverer and the Noble Kulluk, Shell is planning to send the two ships to Asia for repairs. The Coast Guard found 16 violations on the 571-foot Noble Discoverer after the drilling season when the Noble Discoverer was in dock in Seward, Alaska after operations in the Chukchi Sea. The violations included fire hazards and problems with the propulsion system. “Current propulsion arrangement does not result in sufficient speed at sea to safely maneuver in all expected conditions without tow assistance,” the Coast Guard found. The U.S. Coast Guard has turned over its investigation of the Noble Discoverer’s violations to the Department of Justice on the recommendation of Coast Guard Rear Adm. Thomas Ostebo, who oversees Alaska operations, officials said Friday. On Tuesday, under Coast Guard surveillance, four tugboats began to tow the conical drilling unit Kulluk from Kiliuda Bay, 48 miles southwest of Kodiak City, Alaska, to Dutch Harbor. There, it will be loaded aboard a heavy lift vessel for transport to Asia. The Kulluk, which has no independent propulsion, grounded on New Year’s Eve in a pristine, exposed area off Kodiak Island after multiple towline failures in near-hurricane conditions during an attempted tow from Alaska, to Everett, Washington. On January 8, the Department of the Interior’s Bureau of Ocean Energy Management, BOEM, launched an expedited assessment of Shell’s 2012 offshore drilling program in the Beaufort and Chukchi Seas. 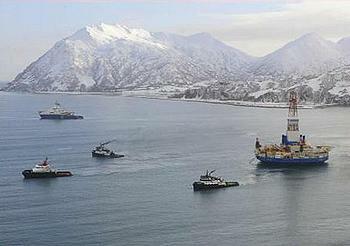 The review, which is expected to be completed by March 9, is focusing on the problems that Shell encountered in connection with certification of its containment vessel, the Arctic Challenger; the deployment of its containment dome; and operational issues associated with the two drilling vessels, the Noble Discoverer and the Kulluk. A separate federal inquiry into the grounding of the Kulluk is also underway. Congressman Ed Markey, a Massachusetts Democrat who is the Ranking Member on the House Natural Resources Committee, today asked for an expansion of the BOEM review of offshore Arctic drilling prospects, given the additional time Shell’s postponement allows. “It is imperative that any drilling operations in the Arctic Ocean occur with the highest levels of safety and environmental protections in place, and I am not convinced that these levels can ever be met given the extreme weather conditions and Shell’s performance thus far,” the congressman wrote. Shell’s statement today said Alaska remains an area with high potential for Shell over the long term, and the company is committed to drill there again in the future. If exploration proves successful, resources there would take years to develop. Environmental groups have demanded that no oil exploration or production take place offshore of Alaska. “Shell began its Arctic folly by declaring they would take every possible step to ensure safety, and then promptly proceeded to fail over and over again,” said Brune. Greenpeace protested Shell’s Arctic drilling endeavor throughout 2012. On March 16, 2012, some 52 Greenpeace activists from five countries boarded Fennica and Nordica, multipurpose icebreakers chartered to support Shell’s drilling rigs near Alaska. Last July, Greenpeacers shut down 53 Shell filling stations in Edinburgh and London in a protest against the company’s Arctic drilling. Greenpeace USA Executive Director Phil Radford said today, “This is the first thing Shell’s done right in Alaska – calling it quits. Shell was supposed to be the best of the best, but the long list of mishaps and near-disasters is a clear indication even the ‘best’ companies can’t succeed in Arctic drilling. Greenpeace’s Save the Arctic campaign aims to prevent oil drilling and industrial fishing in the Arctic and have the region recognised as a world park.